The most often reproduced and widely known work of the German artist Albrecht Dürer is the gray and white brush drawing on blue-grounded paper, entitled the "Hands of the Apostle," generally known as "The Praying Hands"
This 1508 sketch was a preliminary study for an altarpiece commissioned by Jakob Heller (1460-1522), a wealthy merchant, member of the town council, and mayor of Frankfurt. Dürer finished the sketch in detail, to be copied exactly in the final painting of the altarpiece. Only the central panel depicting the Assumption and Coronation of the Virgin was executed by Dürer himself. Dürer worked for 13 months on the final painting, determined to make it so sound and beautiful "that it will remain bright and fresh for five hundred years." Unfortunately, the central panel of the altarpiece was sold a century later by the Dominicans to Duke Maximilian of Bavaria, and in 1729 was destroyed by a fire. A 1614 copy of the Heller alterpiece, done by Jobst Harrich of Nuernberg (c. 1580-1617) has survived. So too, the preliminary sketches that Dürer had prepared for the final painting have survived. Albrecht Dürer was born May 21, 1471, the oldest son and third of eighteen children, to Albrecht Dürer the Elder, an immigrant goldsmith from Hungary, and Barbara Holper, the daughter of Dürer the Elder's employer, in the Imperial Free City of Nuernberg. His father worked hard to support his large family, although only three of his eighteen children survived to adulthood.. He was an honest man who became the official assayer of precious metals for Nuernberg. The younger Albrecht was apprenticed at a young age in his father's goldsmith shop, and trained as a metalworker. But his real desire was to be an artist. He applied the same meticulous, exacting methods required in the delicate metal work to his woodcuts and engravings. Recognizing his son's talents, the father in 1486 sent Albrecht at fifteen to apprentice in the shop of Nuernberg painter Michael Wohlgemut, a painter of outstanding reputation throughout Franconia, and a man of powerful influence in book design and illustration. Dürer remained with him for three years. Here Albrecht received a basic training in the mixing of colors and drawing inks, the preparation of panels, and the composition of large-scale works. It was here that Durer received his first introduction to commerical book making. Wolgenmut and Stephen Wilhelm Pleydenwurff were in the midst of a collaboration with a printer Anton Kolbeger, Albrecht's godfather, in the production of Hartmann Schedel's Chronicle of the World. This manuscript consisted of hundreds of illustrations utilizing the woodcut method of printing. Wohlgemut was the first German painter to design woodcuts as illustrations for the newly developed art of the printed book. With Wohlgemut Dürer had an opportunity to merge the goldsmith skill of engraving with the artistic engraving of woodcuts. His skill in engraving woodcuts may still be appreciated and purchased today, impressions being made from his original woodcuts, 500 years later. The technological innovation of a new printing technology, the invention of movable type by Johann Gutenburg (1398-1468) of Mainz, the development of a cheap method of manufacturing paper and the improvement of the printng press made possible the beginning of the information age, of mass communication and literacy. His apprenticeship complete, Dürer spent two years as a journeyman, traveling to study for a time with other eminent craftsmen in Germany, studying for a time under Matthias Grunewald. Albrecht became familiar with Erhard Reuwich, the first artist who also was a publisher. In Reuwich's work Albrecht found an appreciation for nature studies as well as an awareness of the unique usefulness of the illustrated book. Reuwich, who had spent a brief time in Venice, had learned linear perspective from the Italian artists. Albrecht, realizing he could learn important artistic techniques from the Italians, planned to travel to Venice, but his father called him home to be married first. In an arranged marriage Dürer married Agnes Frey in 1494, who brought a dowry of 200 florins to their marriage. The match appears to have been totally a business deal between Albrecht's father and Hans Frey, a master craftsman who worked in brass and hammered copper. There apparently was not much romance between Agnes and Albrecht although they seemed to have developed a comfortable relationship. They did not have any children. Shortly after his marriage, Albrecht went to Venice, to learn from the Italian Renaissance artists. For the first time he became acquainted with classical art and began to study theories of proportion and perspective. Dürer was encouraged in his artistic studies by two Nuernberg leaders eager to bring the Italian Renaissance ideals to Germany -- Willibald Pirckheimer and Konrad Celtis. All were interested in the ancient classics and the new scientific learning. Dürer returned to Nuernberg in 1495, opening a shop and began building up a stock of engravings and woodcuts for sale. Although Dürer was an artist who could work in a variety of mediums, he realized that woodcuts and engravings made art available to the widest possible public. Dürer hired an agent who could sell his prints in the fairs and markets of Europe. Unlike many artists of the day, Dürer was not dependent on patrons who ordered specific works, but was free to create the art of his choosing to sell to the public. 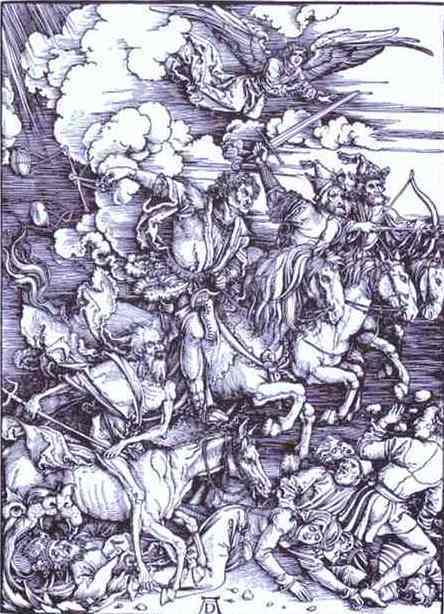 Dürer's earliest major work, The Apocalypse, was a series of large prints illustrating the book of Revelation, with the Scripture on the reverse side. To make these Dürer used large blocks of hardwood cut to the size of full pages of paper, several times larger than the blocks then in use. Dürer's large illustrations were detailed and full of energy. His Four Horsemen of the Apocalypse has never been surpassed. Dürer followed the Apocalypse with Life of Mary and a large and small series on the Passion of Christ. These illustrations were designed to be used by teachers and clergy, but, in a day before widespread literacy, could also be important devotional tools for Christian laymen. Dürer believed art was rooted in nature, and his works gave great attention to detail and realism. He recognized his artistic talent was a gift from God, and he set a high artistic standard for himself so that his work could most glorify his Creator. Dürer did many portraits of famous people in his day, including the humanist Erasmus and Emperor Maximilian I. One of his earliest portraits was of Friedrich the Wise, Elector of Saxony. Friedrich had founded the University of Wittenberg to encourage a Christian classical education. Martin Luther became professor of theology at the university, and Albrecht Dürer came under Luther's influence. Dürer and several of his friends on the Nuernberg City Council had begun attending services at the Augustinian Church. Several times Johann von Staupitz, Vicar General of the German Congregation of Augustinians and Luther's mentor, gave sermon series at the church. Dürer and his companions were deeply moved, as Luther had been, with Staupitz's emphasis on Christ's passion as the only key to forgiveness from sin. When Dürer returned to Nuernberg, he devoted almost all of his work to Biblical subjects. In 1525 Nuernberg became a Protestant city. The following year Dürer made a present to the Nuernberg City Council of The Four Holy Men -- Sts. John, Peter, Mark and Paul. Below the painting Dürer wrote, "All worldly rulers in these dangerous times should give good heed that they receive not human misguidance for the Word of God, for God will have nothing added to His Word nor taken away from it. Hear therefore these four excellent men, Peter, John, Paul, and Mark and their warning." 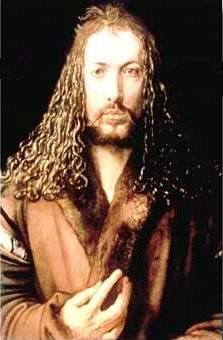 Albrecht Dürer died in Nuernberg on April 6, 1528, just a month short of his 57th year. Treatise On Proportion, his final masterpiece, was being published through his own company, having been in work since 1525, and was at the proof stage at the time of his death. This treatise, Unterweisung der Messung mit dem Zirkel und Richtscheit, is the first mathematics book published in German (if one discounts an earlier commercial arithmetic book) and places Dürer as one of the most important of the Renaissance mathematicians. Dürer's sources for this work were three main sources; (i) the practical recipes of craftsmen, (ii) classical mathematics from printed works and manuscripts, and (iii) the manuals of Italian artists. The first of the four books describes the construction of a large number of curves, including the Spiral of Archimedes, the Equiangular or Logarithmic Spiral, the Conchoid, Dürer's Shell Curves, the "muschellini", the Epicycloid, the Epitrochoid, the Hypocycloid, the Hypotrochoid, and the Limaçon of Pascal, although of course Dürer did not use that name. In the second book he gave exact and approximate methods to construct regular polygons. Dürer's constructions of regular polygons with 5, 7, 9, 11 and 13 sides is discussed. Dürer also gave approximate methods to square the circle using ruler and compass constructions in this book. A method to obtain a good approximation to the trisector of an angle by Euclidean construction is also given. Book three considers pyramids, cylinders and other solid bodies. The second part of this book studies sundials and other astronomical instruments. The final book studies the five Platonic solids as well as the semi-regular Archimedean solids. Also in this book is Dürer's theory of shadows and an introduction to the theory of perspective. Descriptive geometry originated with Dürer in this work although it was only put on a sound mathematical basis in the later work of Monge. One of the methods of overcoming the problems of projection, and describing the movement of bodies in space, is descriptive geometry. Dürer's remarkable achievement was, through applying mathematics to art, that he developed such fundamentally new and important ideas within mathematics itself. 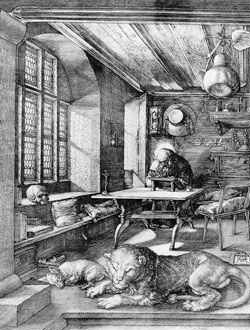 This copperplate engraving illustration, St. Jerome In His Study, well illustrates Dürer's skill and grasp of the subject of projection and proportion. When Martin Luther heard of his death, he wrote, "It is natural and right to weep for so excellent a man . . . still you should rather think him blessed, as one whom Christ has taken in the fullness of his wisdom and by a happy death from these most troublous times, and perhaps from times even more troublous which are to come, lest one who was worthy to look on nothing but excellence, should be forced to behold things most vile. May he rest in peace. Amen." 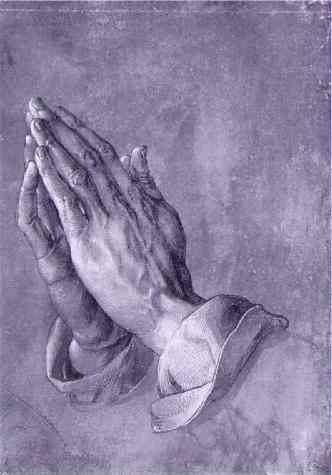 A Link To Many of Dürer's Paintings and Woodcuts"
Below is a wonderfully touching story about Dürer's Praying Hands that is circulated widely. It tells of Dürer doing his creation in appreciation of a brother who went to work in the mines to support Albrecht's education. There his hands were deformed. There is no credible source for this story. It appears to be a relatively modern work of myth and fiction. Back in the fifteenth century, in a tiny village near Nuernberg, lived a family with eighteen children. Eighteen! In order merely to keep food on the table for this mob, the father and head of the household, a goldsmith by profession, worked almost eighteen hours a day at his trade and any other paying chore he could find in the neighborhood. Despite their seemingly hopeless condition, two of Albrecht Dürer the Elder's children had a dream. They both wanted to pursue their talent for art, but they knew full well that their father would never be financially able to send either of them to Nuernberg to study at the Academy. After many long discussions at night in their crowded bed, the two boys finally worked out a pact. They would toss a coin. The loser would go down into the nearby mines and, with his earnings, support his brother while he attended the academy. Then, when that brother who won the toss completed his studies, in four years, he would support the other brother at the academy, either with sales of his artwork or, if necessary, also by laboring in the mines. They tossed a coin on a Sunday morning after church. Albrecht Dürer won the toss and went off to Nuernberg. Albert went down into the dangerous mines and, for the next four years, financed his brother, whose work at the academy was almost an immediate sensation. Albrecht's etchings, his woodcuts, and his oils were far better than those of most of his professors, and by the time he graduated, he was beginning to earn considerable fees for his commissioned works. When the young artist returned to his village, the Dürer family held a festive dinner on their lawn to celebrate Albrecht's triumphant homecoming. After a long and memorable meal, punctuated with music and laughter, Albrecht rose from his honored position at the head of the table to drink a toast to his beloved brother for the years of sacrifice that had enabled Albrecht to fulfill his ambition. His closing words were, "And now, Albert, blessed brother of mine, now it is your turn. Now you can go to Nuernberg to pursue your dream, and I will take care of you." All heads turned in eager expectation to the far end of the table where Albert sat, tears streaming down his pale face, shaking his lowered head from side to side while he sobbed and repeated, over and over, "No ...no ...no ...no." Finally, Albert rose and wiped the tears from his cheeks. He glanced down the long table at the faces he loved, and then, holding his hands close to his right cheek, he said softly, "No, brother. I cannot go to Nuernberg. It is too late for me. Look ... look what four years in the mines have done to my hands! The bones in every finger have been smashed at least once, and lately I have been suffering from arthritis so badly in my right hand that I cannot even hold a glass to return your toast, much less make delicate lines on parchment or canvas with a pen or a brush. No, brother ... for me it is too late." More than 450 years have passed. By now, Albrecht Dürer's hundreds of masterful portraits, pen and silver-point sketches, watercolors, charcoals, woodcuts, and copper engravings hang in every great museum in the world, but the odds are great that you, like most people, are familiar with only one of Albrecht Dürer's works. More than merely being familiar with it, you very well may have a reproduction hanging in your home or office. One day, to pay homage to Albert for all that he had sacrificed, Albrecht Dürer painstakingly drew his brother's abused hands with palms together and thin fingers stretched skyward. He called his powerful drawing simply "Hands," but the entire world almost immediately opened their hearts to his great masterpiece and renamed his tribute of love "The Praying Hands." The next time you see a copy of The Praying Hands, take a second look. Let it be your reminder, if you still need one, that no one - no one - - ever makes it alone! Even though the story is fiction, I hope the intent of the story is appreciated, whether true or not. This page is dedicated to the Seekers of the World in Love and In Peace.